The Newport city commission approved the issuance of $37 million in industrial revenue bonds for Newport Residential Investors, LLC, a company affilaited with Carmel, In.-based CRG Residential, which is placing a 202-unit apartment community on the site. The Newport board of education voted to sell the property in 2015 for $2.625 million. When completed in 2019, prospective tenants will find apartment units with high-end finishes like quartz countertops, said David George, of CRG Residential, who spoke to the city commission on Monday. "It will have all the bells and whistles you want to see for a long-term development," he said. A ribbon-cutting is expected to take place in January, he said. 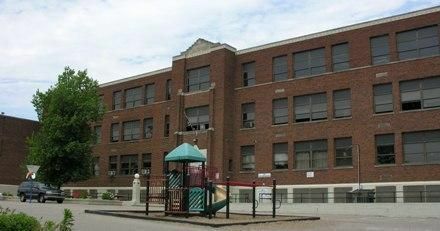 Though one historic school will be razed in the process, another one will be better preserved. As part of the mitigation plan developed in conjunction with the Kentucky Heritage Council, CRG has committed to improving the facade and windows of the Southgate Street School, the city's former school for black students which opened last month as a Newport history museum. That effort will help maintain some of the historic character of the a neighborhood now dominated by newer developments such as Newport on the Levee and its neighboring entertainment and residential offerings. "Not only will we have our project, but we'll be able to help, in some small way, the project down the street from us," George said. Attorney Jim Parsons, representing CRG, siad that the industrial revenue bonds would involve no financial obligation from the City of Newport. The project was well-received by the city commission, though Commissioner Ken Rechtin said that the city should move away from subsidizing rental projects. "It's not something I think the city should pursue in the future," he said. "We want more home ownership and by subsidizing more rental units, I don't think we're doing what we need to do." The bonds were approved by a 5-0 vote. "It's a great project and I can't wait till it's completed," Mayor Jerry Peluso said.